New and Exclusive: Avo Cigars! If you’re a regular reader of this blog (thanks for that, by the way. Can you believe I’ve been writing this for nearly three years now? Doesn’t time fly?) you’ll probably know that I get disproportionately excited whenever we get a new line of products in. Usually because it gives me the excuse opportunity to sample a load of things I’ve never tried before. This week, I have the added bonus of trying a range that is not only new, but also totally exclusive to C.Gars Ltd: Avo Cigars. These are Dominican-made cigars and come in a variety of blends, ranging from mellow and easy to powerfully full bodied. So naturally, I’m going to work my way through them so I can give you the lowdown. It’s a tough job, but someone’s got to do it! Perfecto: a 4 5/8” x 50rg double figurado. Like I said, this format gives the unusual experience of allowing the smoker to taste only the outer leaves of the cigar for the first few puffs. In the case of this cigar, that gives a very pronounced spicy flavour, which becomes a subtle undertone as the rest of the blend is gradually revealed. As you get further in, earthy, cocoa and vanilla notes slowly build to a rich, medium-full taste that is extremely satisfying. Great for an after-dinner smoke! also have a classic tubed corona format (5” x 43, in this case) in the form of the Notturno. I cracked on with this blog about 9am this morning and lit up a Preludio as I started, so I can vouch that these make for a perfect breakfast cigar. Mellow enough to not blow your head off, but complex enough to shake up your taste buds a bit, first thing in the morning. Or as they put it “Complex, but not complicated.” (which is a phrase I’m definitely going to steal). We’ve only had these available for a couple of days, so I’ve not actually had time to test any more of the range, but just to keep you all up to date, here’s a quick run-down of the rest of the range. I’m sure I’ll manage to taste a few more before my next blog to give you my personal notes . Looking at these, it seems like they’re going to be in the same sort of territory as the XO, as they have the same composition: Dominican Filler and Binder, dressed in a silky Ecuador Sun-Grown Wrapper. Again, this promises a mild, creamy smoke which should be ideal for an early morning smoke. Especially if you’re a breakfast-skipper like me! Currently available in the tubed Robusto format and the 4 ¾” x 48rg No.9. Back up to the more full bodied end of the spectrum again with these and once again, we have a Dominican Filler and Binder, but this time the wrapper is a Special Ecuador Sun-Grown Habano leaf. The formats available are both short and stock options: A 4” x 56rg Short Robusto or for figurado fans: The Short Torpedo (4 ½” x 52rg). These promise to be beefy smokes, with the potential for huge clouds of smoke, with notes of dark cocoa, roasted nut, sweet oak and spice. They sound pretty awesome, so I’ll definitely be trying one soon! Ok, so to finish off, these are something totally different to the rest of the range. First up, they include tobacco from a variety of regions; They might call themselves Nicaraguan, but the filler actually contains tobacco from Nicaragua, Dominican Republic and Peru! This is contained within a Domican binder and finished off with an Ecuador Habano-Connecticut hybrid wrapper. Intriguing, right? On top of that, they also have something very rare: A boxed pressed tubo! That’s right, they actually produce a cigar in a cuboid tube! They really stand out as a real eyebrow raiser amongst the rows of round tubes in the humidor. I don’t think I’ve ever seen something like that before, so I think it’s pretty cool (it’s the little things in life, right?) As well as the aforementioned Box Pressed Toro Tobo, you can also get a Short Robusto (also box pressed, but without the cool tube, sadly). So that’s the full range of these exclusive new cigars. I’ve been pretty impressed with what I’ve had so far and I’m definitely excited to explore the rest of the family! 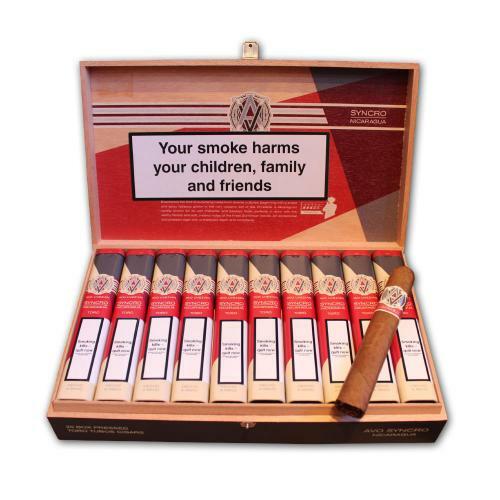 They’re great tasting cigars and excellent value to boot, with options starting from just under £10 per cigar and nothing getting any more expensive than £15.99. Definitely worth checking out!